Australia tourism undoubtedly has an immense potential and this has been repeatedly proved by statistics which have shown that the country stands among those other nations who earn their highest revenue from tourism. It has consecutively earned the title of being the 10th highest revenue-earning nation in 2002, 2003 and 2004. Today it has emerged as the largest revenue-earning sector of the country. Australia tourism contributes to nearly 3.9% of the Australian GDP which is nearly A$32 billion. The tourism sector has shown such marked development in recent years that the total consummation of Australian goods and services by foreign visitors was 11.1%. The varied topography of Australia, merged with an unparalleled climate has transformed Australia into a tourist paradise. Besides this varied topography, Australia is also rich in flora and fauna and houses rare wildlife species, they in turn attract some other kinds of tourist like, the nature lovers. Australia tourism has never had to face any sharp decline, as the place has remained a tourist haven for the past many decades and even continues to be so. Australia's tourism potential was slightly affected after the country had to share the fear of terrorism that had attained global standards after September 11, 2001. Some other reasons of fright, like SARS, Bird flu and Equestrian fevers have affected the influx of tourists to the country. 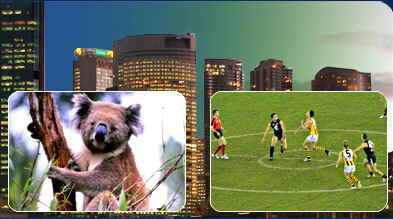 All tourists who wish to explore the country require informing the Australian tourist department in advance. At present all tourism activities in Australia has been placed under the jurisdiction of Tourism Australia, a government body which is responsible for promoting and developing tourism in Australia. All tourists to the country require to visit Australia with a full visa which is granted only after thorough checking of the tourist's documents. Only tourists from New Zealand are granted entry into Australia without prior permission. Tourism Australia looks forward to promoting Australia largely as an uninhabited continent with rare wildlife and endless sand and surf. The image the country has on the tourism portal is largely that of a friendly nation with small cities and a very relaxed environment. The added attraction comes in the shape of a rare taste of Australian exotic life in the form of the Aboriginal culture, the natives of this small continent. Tourism Australia has taken care to promote Australia in this very light of a fun-filled, unexplored, exotic nation which also has lots to offer to nature lovers. Some of the more popular and most often visited places within Australia include places within the different states of Australia and Tasmania, these are; Melbourne, Sydney, Gold Coast, Perth, Brisbane, Adelaide, Sunshine Coast, Whitsundays, Uluru, Hunter region and far north Queensland. Tourists are also attracted to the country in the quest of pursuing popular sports like rugby, Australian rules and horse-racing. Australia tourism has gained considerable success due to its vast and varied wildlife and the numerous wildlife parks and zoos that it has. The exotic life also draws numerous backpackers to the country, who visit Australia mainly to explore it.